EPA Administrator Scott Pruitt offered his resignation to President Donald Trump on Thursday, saying it was "an honor" to serve in his cabinet. President Trump announced Pruitt's resignation on Twitter, praising his work at the agency. "I have accepted the resignation of Scott Pruitt as the Administrator of the Environmental Protection Agency," Trump wrote. "Within the Agency Scott has done an outstanding job, and I will always be thankful to him for this." "I have no doubt that Andy will continue on with our great and lasting EPA agenda," he wrote. "We have made tremendous progress and the future of the EPA is very bright!" 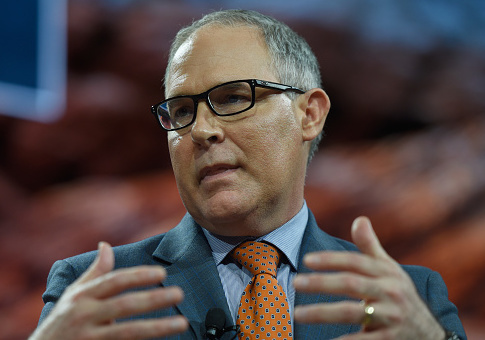 Trump also said the agency will be led in the immediate future by Pruitt's deputy Andrew Wheeler, who faced Senate confirmation for his current post. This entry was posted in Politics and tagged Scott Pruitt. Bookmark the permalink.